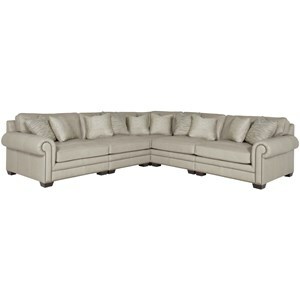 Create the perfect space to gather with family and friends with this traditional five piece sectional. 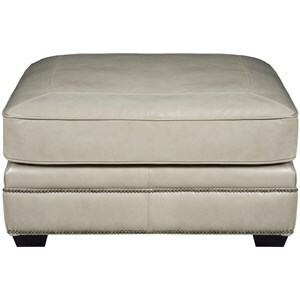 Enjoy watching the big game while relaxing in the plump box seat cushions and plush back pillows. Throw accent pillows provide additional comfort and support. 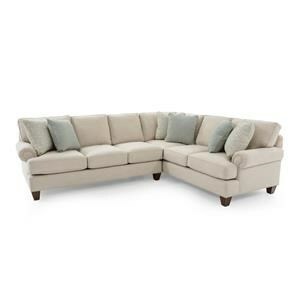 This comfy sectional sofa brings a classic design to your home with its smooth rolled arms, thick block feet and nailhead trim. 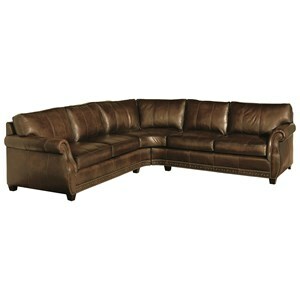 Enhance your living room, family room or home entertainment room with the traditional style of this cozy sectional sofa. 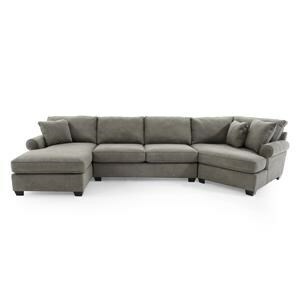 The Grandview 5 Piece Traditional Sectional Sofa by Bernhardt at Baer's Furniture in the Ft. Lauderdale, Ft. Myers, Orlando, Naples, Miami, Florida area. Product availability may vary. Contact us for the most current availability on this product. 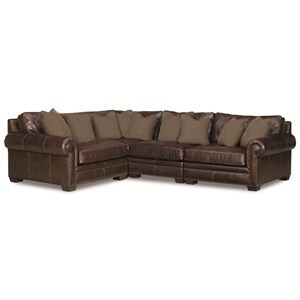 Fabric Options The leather collection is a full line of top-grain, fully aniline dyed leather products in a variety of leathers, fabric/leather combinations and finishes. A wide variety of fabric combinations and finishes are also available. 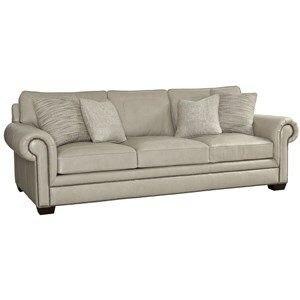 Arm Elegant rolled arms add a classic design with nailhead trim. Leg or Skirt Exposed wood block feet. Frame Construction Frames utilize engineered, multi-ply hardwood plywood as well as some 4/4” and 5/4” hardwoods (Certain frames may also incorporate formed plywood in order to achieve certain frame contours.) All exposed wood frames employ 5/4” mixed hardwoods. Seat Support This collection features sinuous spring construction. 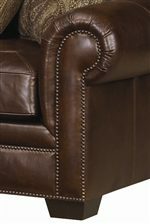 Upholstery has a reputation for fine craftsmanship. Using long-lasting steel springs, and other durable materials, skilled artisans assemble Bernhardt upholstery with your ultimate satisfaction in mind. The Grandview collection features a sectional sofa and ottoman that will bring spacious and comfortable seating to your living room, family room or home entertainment room. 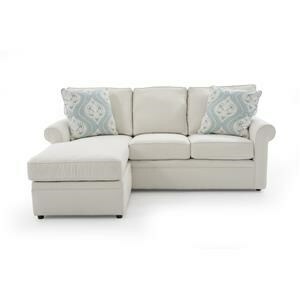 Cozy back cushions, plump box seats and a variety of throw pillows provide the ultimate in comfort and support while you relax and watch the big game or a favorite movie with family and friends. Complete your home with the traditional style of the Grandview collection. Choose from a variety of fabrics and leathers to create a custom look to fit your home perfectly. 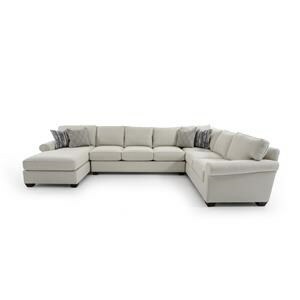 The Grandview collection is a great option if you are looking for Casual furniture in the Ft. Lauderdale, Ft. Myers, Orlando, Naples, Miami, Florida area. 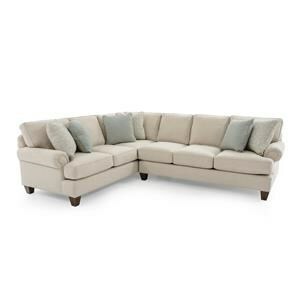 Browse other items in the Grandview collection from Baer's Furniture in the Ft. Lauderdale, Ft. Myers, Orlando, Naples, Miami, Florida area.